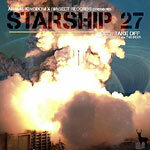 In 2009, an album emerged out of nowhere like a UFO sighting calledStarship 27. The album, curated by drummer, producer, and DJ, J-1,featured an assortment of West Coast beat producers. Shortly after the album's release, the eclectic Texas label, iNsect Records, got in contact with J-1 and struck up a conversation which eventually led to Starship 27 Vol. 2 being released. This time around on Vol. 2, we see the list of tracks and producers expand including music by Dam-Funk, Dibia$e, P.U.D.G.E., Devonwho, Ras G and Houseshoes to name only a few. With Starship 27 Vol. 2, J-1 becomes the curatorial captain guiding the spacecraft on its voyage. ''I chose all these folks because I'm truly a fan of all their music...'' says J-1 ''I just really think it's a cool concept to have all these kats on 1 joint so everyone can really see the talent that's in our community. And what exactly is the unexplained phenomenon Starship 27? When asked about it, J1- replies, ''the secret to the name will berevealed on the 3rd installment of the trilogy.'' LIMITED PRESS OF BLUE COLORED VINYL.